You can use the Find and Replace feature in most software programs to spot extra spaces. Sometimes, if you type too fast, you can get an extra space or two. Professional book publishers and designers use one space after a period. If the text is justified—aligned on both sides—the extra space shows up even more. A professional designer aims for consecutive word spacing—the space between words. Why should some spaces be bigger than others? Did you notice the extra spaces? There are two spaces after the word “two” and three spaces after the words “more” and “words”. After typing your story and running a spell check, do a Find and Replace. 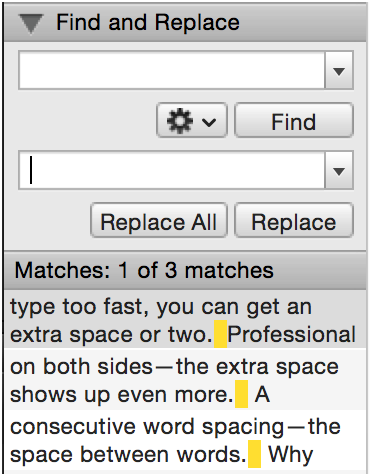 In Microsoft Word, choose Edit > Find > Replace. In the panel, click in the first text field and press the Spacebar on your keyboard twice. Click in the second Replace With text field, and press the Spacebar on your keyboard once. 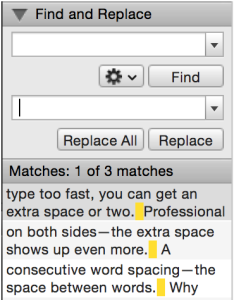 Click on the Replace All button to replace all double spaces with one space.